Can we make two systems A and B interact with one another, so that system B is influenced by system A, but system A is completely insensitive to B? 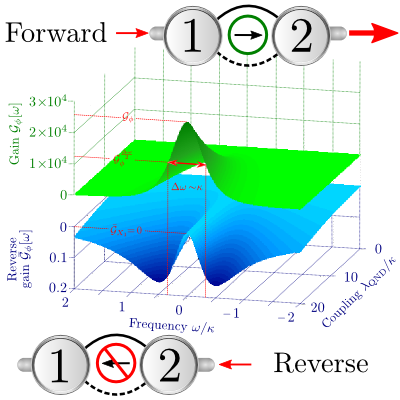 We recently devised a very general way to construct such "non-reciprocal" interactions, by having both systems talk to a dissipative environment in just the right way. Our approach doesn't rely on magnetic fields or magnetic material, and could be used to construct new kinds of directional quantum microwave and photonic devices. Implenting these kinds of interactions on a lattice could also lead to a range of unique quantum phases. A common way to measure information in quantum-dot qubits is to use the current through a nearby quantum conductor (a quantum point contact) as a detector. Quantum mechanics tells us that any time we look at a system, we must somehow disturb it (this is back-action), and this scheme is no different. Experimentalists both at NRC Ottawa and the LMU in Munich recently observed a striking effect where the back-action disturbance strongly oscillated as a function of quantum dot energy level spacings. We were able to explain this in terms of quantum interference and a phonon-mediated back-action effect. A joint experiment-theory paper recently appeared in Nature Physics. There is has been a remarkable amount of progress in using driven optical and microwave resonators to make quantum measurements of micron-scale mechanical structures. 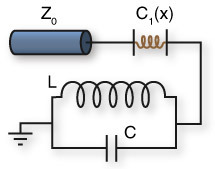 The usual setup is that the frequency of the resonator depends on the mechanical position. We recently developed a theory of dual version of this system where the mechanical element now modulates the coupling of the resonator to the dissipative bath which both drives and damps it. Remarkably, interference effects are important in this system, leading to a number of surprising & useful quantum back-action effects.